Commercialization of biofuel in the aviation industry, which could help reduce carbon emissions, is a long-term goal that requires a sustainable business model, experts noted on Thursday. China recently made a step forward in applying biofuel in commercial jets, one way to meeting goals for a green economy and low carbon emissions. 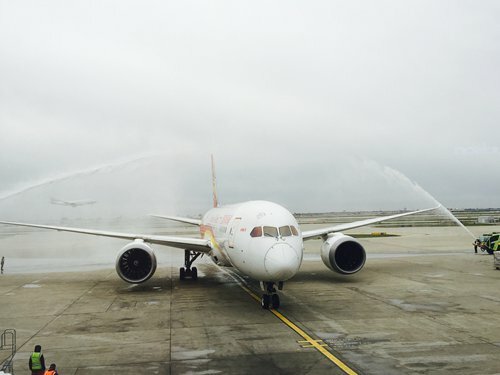 The Chinese commercial flight powered by biofuel completed a transoceanic flight on Wednesday, according to a statement Hainan Airlines sent to the Global Times on Thursday. The biofuel was produced by China Petrochemical Corp (Sinopec Group), mainly from waste cooking oil from restaurants, the company said in an e-mail. The jet was powered by a mix of 15 percent biofuel and 85 percent conventional fuel. Biofuel, manufactured from renewable sources such as vegetable oils and animal fats, could help reduce carbon emissions by 50 percent compared with conventional petroleum-based fuel, the Chinese oil producer noted. 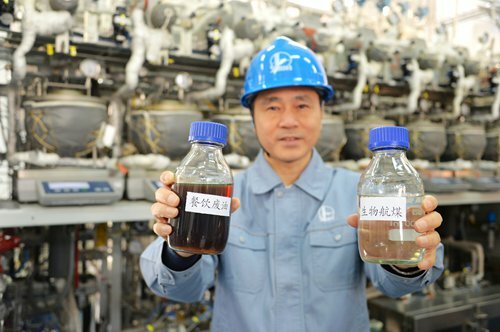 "When biofuel goes into commercial production, it will bring benefits, especially in tackling environmental pollution," Li Li, director of research at Shanghai-based industry consultancy ICIS, told the Global Times on Thursday. "However, there is still a long way to go to commercialize this new energy source," she said. The Civil Aviation Administration of China has set a target of reducing greenhouse gas emissions from aircraft by 4 percent or more on average by 2020, compared with the period from 2011 to 2016, according to guidelines released by the authority in February. Burning a ton of petroleum-based fuel yields 3.2 tons of carbon dioxide, Sinopec noted in the statement. China's aviation industry consumes about 30 million tons of fuel every year, so if it was entirely replaced by biofuel, that would help reduce carbon dioxide emissions by 33 million tons annually. Though Chinese companies have made breakthroughs in using biofuel in the aviation sector, there is no supply chain in the industry, Li noted. "The average cost of biofuel is much higher than conventional fossil fuel, especially when the crude oil price remains relatively low," she said. China is not the only country that encourages using new energy sources like biofuel in the aviation sector. In 2011, the European Commission teamed up with planemaker Airbus as well as major European airlines including Lufthansa, Air France and British Airways with the aim of achieving 2 million tons of sustainable biofuel being used in the EU civil aviation sector by 2020, according to its website. The US Federal Aviation Administration aims for the US to use 1 billion gallons per year of sustainable alternative jet fuel by 2018, as that could reduce emissions and diversify fuel supplies, according to its website. Some major US airlines have been working toward a long-term goal of utilizing aviation biofuel in all their flights. "The rapid growth of China's civil aviation sector, which drives demand for jet fuel, provides scope for biofuel development," Lin Boqiang, director of the China Center for Energy Economics Research at Xiamen University, told the Global Times on Thursday. The country generates huge volume of waste cooking oil in restaurants, which has to be appropriately handled, the expert noted. "In China, a significant quantity of used cooking oil has been reused in restaurants and food-processing facilities, which jeopardizes people's health," Lin said. "If we could come up with a more sustainable and cost-effective business model, biofuel derived from used cooking oil could bring more benefits to China besides environmental protection," he added.